The present hamlet of Moseley Green to the East of Parkend in the Forest of Dean is the location of our holiday cottage in September 2017. Historically it was alongside the Severn and Wye Railway’s Mineral Loop line. Prior to that two collieries are shown as existing on the site … Independent and Branchers. However, much of this industry was small scale and transient and records suggest a whole variety of different mines in the area. 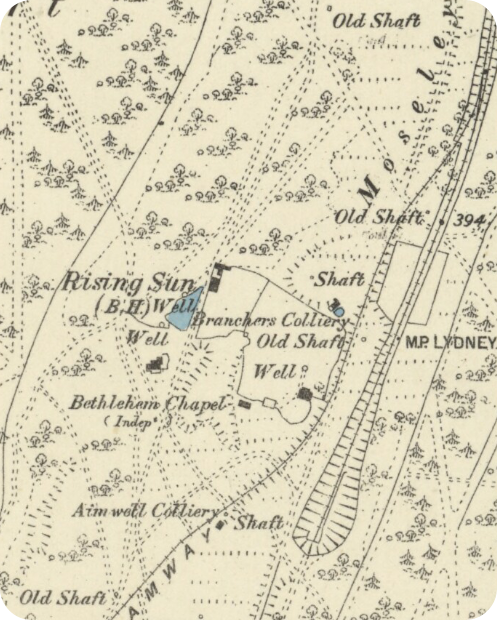 The map above is an extract from the 1901 Ordnance Survey Map and shows evidence of the Independent and Branchers collieries. The Rising Sun Pub is prominent on this map and had been in existence on the site since the 18th Century. Of these three images, one is from around the turn of the century and was taken by the Rev. A J Lumbert. It is a glass plate that has been hand-coloured. The location of the pub was close to two pits and the railway line and miners of the Forest have drunk here over many years. In 2017, the pub buildings have been enlarged. As the other pictures illustrate. The food offered is excellent! Moseley Green has always been a small hamlet. There isn’t a great deal of information about its history. The following notes can be found at http://www.forestofdeanhistory.org.uk …..
A survey undertaken from Parkend up the road past the school to Moseley Green in April 1834 noted that Moseley Green was… “full of pits part of which are now working but the greater part are abandoned and filled up.” (3) The area is covered with bell pits and the note might indicate that some were still at work at that time. The closure of some of the collieries at Moseley Green in the early 1870s is inferred by the visible reuse of some of the spoil heaps as embankments for the Severn and Wye Mineral Loop Railway which was constructed between 1870 and 187 (4:p106). A reference is made to a Pluckpenny Rockey Colliery in a 1896 survey. At the time of that survey work had apparently ceased (5). The owner was W.H. Jones, Stag Inn, Yorkley. There were a number of short lived attempts to establish nonconformist worship in Moseley Green. The Congregationalists were, in 1860, holding services at Berry Hill and Coalway Lane End and in 1865 they had a small congregation at Moseley Green. That congregation, worshipping in a room at an abandoned colliery, included Mary Young, keeper of the Yorkley turnpike gate, with whose assistance Samuel Ford of Blakeney built a chapel at Moseley Green. The chapel, opened in 1866, was called Bethlehem and was sold to the Primitive Methodists in 1894. Primitive Methodist services held at Moseley Green from 1859 were discontinued in 1864 for want of a congregation. They were resumed in 1867 and a chapel called Providence, standing north-east of the Barracks, was registered in 1879. In 1894 the meeting moved to the Independent chapel some way south but in 1898 it returned to its former home. The return led to a drop in support and in 1907 a new chapel was built on the Blakeney-Parkend road to the south. That chapel, which was abandoned in the mid 1950s, fell into ruin but in the late 1980s it was rebuilt as part of a new house. In 2017, we stayed in Rosebank Cottage in Moseley Green. The cottage was one half of what was built as the Methodist Chapel in 1859 but closed in 1864. In 1960 the chapel was finally converted into two cottages losing most of its ‘chapel’ features. The 1881 Ordnance Survey clearly shows Rosebank Cottage cand its neighbour as Bethlehem Chapel. Moseley Green sits alongside the Severn and Wye Joint Railway’s Mineral Loop which closed in the 1950s. It is just north of the north portal of the 503yd Moseley Green Tunnel. The tunnel must have been a nightmare for engine drivers. The rising grade of 1in 40 would have placed significant demands on the Pannier 0-6-0s in use in the forest, particularly when pulling a full load of coal wagons. 7 February 1843 to Thomas Morgan of Arthurís Folly near Parkend for a pit situate on Moseley Green about 90 yards north of Cockshot Inclosure and about 65 yards east of the Parkend – Blakeney turnpike road, to get the coal from the Coleford High Delf, Yorkley and Whittington veins. 27 June 1843 to Thomas Morgan, for a pit situate on Moseley Green about 250 yards on the deep side of the gale called Morganís Folly No. 1 to get coal from the Coleford High Delf and all unalloted veins between it and the Oaken Hill Delf. 11 March 1847 in equal parts to Samuel and Thomas Morgan, of the Folly, for a pit situate on Moseley Green, to get coal from the Coleford High Delf and all the unalloted veins above the same and below the Churchway High Delf or Oaken Hill Delf veins. On the land side of the deep workings of Morganís Folly No. 2. June 1859 Morgan’s Folly No. 3, Samuel Morgan proprietor. Midsummer 1861 Arrears of rent for Morgan’s Folly No. 3 stand against Saml. and Thos. Morgan, Whitecroft. 27 May 1895 Messrs. Bruton, Knowles & Co. will offer the Moseley Green Collieries and the plant etc. in one lot on Wednesday next. If the colliery not sold the auctioneers will offer machinery. Connected to Severn & Wye by a siding. Three gales in deep and three overlying viz. Moseley Green New Engine Colliery, Morgan’s Folly No. 1 Colliery, Morgan’s Folly No. 2 Colliery, Morgan’s Folly No. 3 Colliery, Moseley Green New Engine No.2 Colliery, and Two Brothers Colliery. Total area of coal 1,700 acres, average thickness exceeding 3í 2î. 7,000,000 tons. With the winding engines, two shafts, boilers, pumps, railway siding, foremanís house, workshops etc. Sold to Shepherd and Johnson for £460. This entry was posted in Forest of Dean, Railways Blog on September 25, 2017 by rogerfarnworth.